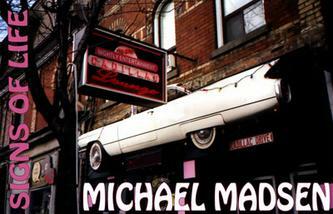 Best known for the tough guy roles he often plays, actor Michael Madsen is also a respected photographer and poet. In 2006 he published a book of his photography titled "Signs of Life". "Signs of Life is actor/poet Michael Madsen's (Reservoir Dogs, Kill Bill, et al) first book of Photography that chronicles his eye for the unusual: from the hotels, diners, and hip lounges to the vanishing small shops and businesses that have become an endangered species in today's sea of corporate logos. This book also captures the rusted, abandoned symbols of where life once was, hence the other signs of life." Madsen's poetry is interspersed throughout the book. Michael Madsen has also published a book of his poetry titled "The Complete Poetic Works of Michael Madsen, Vol. I: 1995-2005", which is a compilation of his six previously published books of poetry.